Jared Naimark ’14 is the male president of what has for a long time been a predominantly female association. 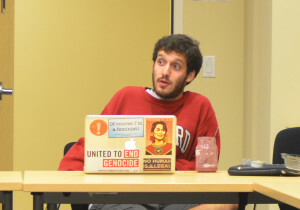 STAND, a student coalition against genocide, is one of the many groups that offer students the opportunity to get involved in public service. And like most public service organizations on campus, gender imbalance is the norm. Take a look at any public service group and you’ll notice the startling gender disparity. Thomas Schnaubelt, executive director of the Haas Center for Public Service, has worked in more than 36 civic engagement institutions. He confirmed that the phenomenon of female public engagement trumping male participation is not limited to Stanford, saying that some research has shown the typical ratio for male to female participation in public service is approximately 3 to 7. But just because this phenomenon is quantifiable does not mean it’s explainable. For years the Haas Center has not only been trying to find ways of increasing male participation in public service, but also attempting to shed light on the roots of this gender gap. Naimark proposed a “self-perpetuating cycle” in which women are drawn to public service. Naimark questioned whether the gender gap is an issue of time and priority, rather than “lack of interest.” He believes that women are more likely to prioritize public service. In STAND as well as in other student organizations, the gender disparity has not gone unnoticed. A project pioneered by Haas Center faculty co-director Larry Diamond ’73 M.A. ’78 Ph.D. ’80 is currently examining this trend on the American undergraduate level with the help of doctoral students in education and sociology. The Haas Center has also attempted to close the widening gender gap, particularly targeting students in “male-dominated” areas, such as engineering and computer science, according to Schnaubelt. For example, Code the Change is a program founded and directed by Sam King ’12 M.S. ’13 that allows students to use their programming and design skills for social change in areas like public health, democracy and governance, education, and entrepreneurship. As director of Student Development and Leadership Programs at the Haas Center, Kristina Lobo is also looking forward to investigating the gender trend in public service on campus. She has made efforts to increase the number of male participants in Haas Center programs. For Lobo, it is a “judgment call” in terms of transforming attitudes and eliminating stereotypes. The research conducted by the Haas Center will also delve into public service engagement along academic lines. According to both Schnaubelt and Lobo, the major with the most students engaged in public service is Human Biology. Schnaubelt explained that the large number of student volunteers with undeclared majors at the Haas Center makes it difficult to assess concrete patterns between academic disciplines and public service. The results of the study will be released in the spring. As a student activist, Naimark noted that he looks forward to building bridges across the gender gap in public service.